The name of this site, Steep Trails, is kind of a misnomer. The destinations outlined here are not necessarily steep climbs, or for that matter trails, but mostly less traveled routes and places that I found interesting. Steep trails could be thought of as places off the beaten path. The treks were sometimes arduous, sometimes not, but all were rewarding and so I’ve added them here. I’ve been camping and hiking since I was very young. My grandparents were ardent campers, so I spent many summers camping in different areas around Western Washington. 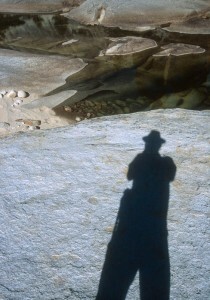 But it wasn’t till I was in my 20s that I met a good friend who showed me some of the wonders of off-trail adventuring. We’d pick routes and destinations based on how interesting it looked on the map… then going out and seeing what it was really like. He also showed me the beauty of the Sonoran Desert. A place I still need to visit every year. Not quite as spectacular as the Sierra or lush and inviting as the Northwest or the Rockies, but intricate and amazing in its own way. That said, I don’t think I could pick one general area over another. They each have something to offer. Photography has also been a passion and pastime for me. I’ve always tried to take pictures that would capture what the experience was like… and for the most part failed. It can’t be done. What you do get are slices and snippets that bring back the memories… so I guess that works too in a way. Steep Trails is also an homage to the man who wrote about the experience. John Muir. I was inspired by his poetic writings and passion about the out of doors. And his message. Get out there. "Twenty years from now you will be more disappointed by the things that you didn't do then by the ones you did do. So throw off the bowlines, sail away from the safe harbor. Catch the trade winds in your sails. Explore. Dream. Discover."